>While it shows in these times of recession and slowdown, that even malls are causing frustration among the people, and i am back from my trip to Manali and well into term 6, the best way to pass time is to watch ads. It is time again to award those who build brands. The ad agencies and the people behind it. 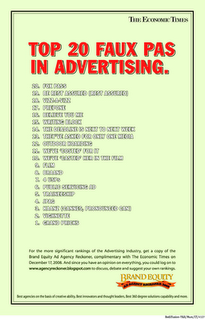 yes i am talking about the annual Brand Equity Ad agency Reckoner.The annual special edition, to be out today (Am awake waiting!!) has, over the last five years, emerged as one of the most-anticipated issues of Brand Equity (Economic Times on Wednesdays). Packed with power lists, rankings and analysis, the Agency Reckoner is a concise guide to India’s most admired creative and media agencies. And a reliable barometer for the hottest names in the business. The question that’s foremost on many lips is whether Ogilvy will be able to hold on to the numero uno position for the sixth year running. Or will the successes of some agencies at Cannes — and the marketplace — see the rise of a new No 1? There’s also curiosity over which agency will top the Media Agency rankings — Mindshare, Madison or Starcom? And will there be dramatic changes in the Most Influential People lists? All we can say is there are surprises galore. The thing that has really caught my eye is the way the edition and the event have been marketed, with these innovative ads. If not anyone else, probably the agency behind these ads should be given away the prizes. Subtle, made with low cost, but in line and very effective with an underlying humour. All speaking out the truth about the ad industry. 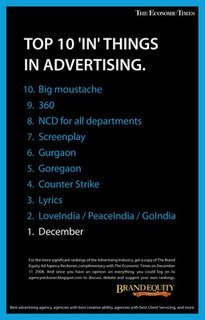 probably Fashion conscious Madhur bhandarkar can get inspired and go on make Ad-War-Teasing (Sourced from PRISM – The marketing cell of IIML). 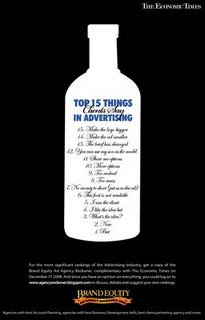 Have a look at the award winning ads. Er! I mean the ads on the awards. So, while i have a look into the latest scandal to hit the US markets and wait for the ET copy, do have a look around. Also, Hold your fingers close for my new blog on leadership Discovery as a compulsory part of my elective with the same name. it is being taught by Professor Debashis Chatterjee. He was described as one of the “thought leaders” of the world by Professor John Kotter of the Harvard Business School for his contribution to the theory and practice of leadership. So looking eager for more classes by him. Also, soon to come is my post on my trip to Manali last weekend. So till then, have fun and look for your Rab arranged Jodi!!! >Hi Bharath, good to see a new look to your blog. Will return to read more.